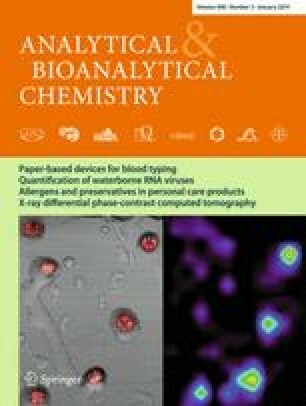 Fungal secondary metabolites in both fruiting bodies and pellets from submerged cultures of basidiomycetes were analyzed by atmospheric pressure matrix-assisted laser desorption/ionization-mass spectrometry imaging at a lateral resolution of 15 μm, a mass resolution of 140,000 at m/z 200 and a mass accuracy of better than 2 ppm. The striatals A, B, C, and D, and a number of erinacine type metabolites were detected in the basidiomycetes Cyathus striatus and Hericium erinaceus, respectively. The two fungi were selected as model species, as they are well-known for efficient production of terpenoid secondary metabolites with interesting biological activities, e.g., antibacterial, fungicidal, cytotoxic properties, and stimulating effects on nerve growth factor synthesis. The localization of metabolites revealed a mostly homogeneous distribution of the striatals in the pellets of C. striatus, while a concentration gradient, increasing to the center, was observed in the pellets of H. erinaceus. A mostly homogeneous distribution of metabolites was also found in the fruiting body of H. erinaceus. Dhaka Ram Bhandari and Tian Shen contributed equally to this work. The online version of this article (doi: 10.1007/s00216-013-7496-7) contains supplementary material, which is available to authorized users. Financial support by the Hessian Ministry of Science and Art (LOEWE Research Focus ‘integrative fungal research’) and by the Deutsche Forschungsgemeinschaft (DFG, Sp 314/13-1) is gratefully acknowledged.